UNITED NATIONS, May 6 -- Answering a question about Iran on Thursday the UN Ambassador of Uganda, a member of the Security Council, said "we should not let the development of science makes nuclear weapons move faster than us, who are trying to stop these monsters of mass destruction." 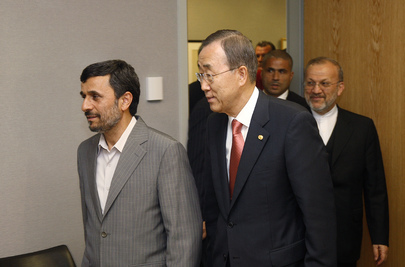 Ahmadinejad recently traveled to Uganda, in what was reported as a trip to lobby for Uganda to vote against nuclear sanctions on Iran. Afterwards, Uganda's position was that it would confer with other African nations, which it represents on the Security Council, and would seek "clarification" from the Obama Administration in the US. Some read this as putting Uganda in the camp of Brazil and Turkey, for example, said to be skeptical of sanctions on Iran. But Uganda's Ambassador Rugunda on Thursday thundered against even non-weapon nuclear developments unless they could be closely monitored. He is a medical doctor, graduate of the University of California at Berkeley, and a member of a group against nuclear weapons. 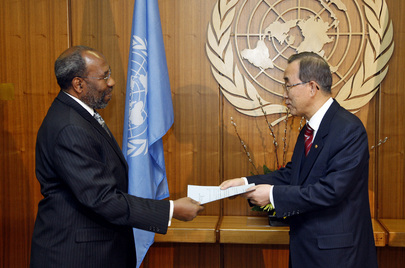 Rugunda was also his government's representative at the talks in Juba, South Sudan with the Lord's Resistance Army. He was asked about this, and characterized the LRA as reduced to groups of four or five "causing trouble." There are, however, reports from the Congo of massacres of 100 and even 300 civilians at a time by the LRA. In the WIF audience on Thursday was Madam Yoo (Ban) Soon-taek, the wife of Secretary General Ban Ki-moon. Rugunda was introduced, quite formally and informatively, by his wife Jocelyn. While Thursday's session was productive, some thought the grouping a bit anachronistic, asking, are their any male spouses of Permanent Representatives, for example those of Brazil, Luxembourg, the U.S. and one other Permanent Five Security Council member? The group will hear next month from New Yorker author Adam Gopnik. The group's webmaster is leaving. So... watch this site. Footnote: the Security Council members are set to dine Thursday evening with Iran's Foreign Minister Mottaki at the Iranian resident on Fifth Avenue and 84th Street. France will be represented by its "Charge d'Affaires." It is not clear who will be representing the United States. We'll see. Or, the UK PR and DPR will be drinking away their sorrows at Labour's loss, or celebrating the Conservatives' failure to gain a majority. One wondered if the Germans -- the one in the P5 Plus One -- are invited, at least for dessert.